Hi all – just to let you know that I’ve got a new YouTube series, where I talk about the “witchier” side of my spirituality, what I do as a Witch and how I work with the forces of nature 🙂 Something similar, yet different, from my Druid work! Druids aren’t associated with magic in the same way that other Pagan traditions, such as Wicca or Witchcraft seem to be. Yet I’ve found that in every spiritual path, there are elements of magic contained within that are often very similar in nature. What is Druid magic? Do Druids cast spells? Have magical tools? Do we think of Gandalf, brandishing his staff and saying mightily “You Shall Not Pass!” or his mushroom-addled fellow, Radagast, who lives in the woods, talks to animals and, according to the latest Hobbit films, has a rabbit-powered all-terrain sleigh and brings hedgehogs back from the dead? Of course it’s none of these things. It would be pretty cool if it were. But Druid magic, like all magic, is subtler than what we see on the screen or read in books. There isn’t lightning shooting from fingertips or fire balls sparking from one’s eyes. In fact, many modern Druids don’t use magic at all, or don’t call it magic. So what is magic? It has often been quoted these days as manipulating the natural forces of energy within nature to provide a desired result. This could have many interpretations. Flicking a switch and having my living room lit up at night could fall within this category, but I’m being a bit facetious. It is also often said that magic should be the last recourse after having tried all mundane means of solving a problem. So how do Druids use magic, if at all? There is a growing trend of blending Wicca and Druidry, as in Philip Carr-Gomm’s new book, Druidcraft. This is a lovely way of expressing the divide between two very similar paths; kind of bridging the gap that lies between. I thought the book, especially the audio book, was brilliant, and yet I’m still not one to perform spells on a regular basis. Why is that? As stated previously, magic is often the last recourse to a situation. If all other means have been tried, and I’m plum run out of ideas, then I might turn to magic. I might equally turn to prayer. Praying for some guidance, asking the gods, the spirits, the ancestors for a little advice when I’m stuck could be called a spell – it could also be called a prayer. Lighting a candle and some incense, meditating and then seeking some clarification or inspiration from the ancestors could indeed look like the workings of a magical spell. I think perhaps the difference is in the intention – in both magic and prayer, we are hoping for a result, but the results are often different. In prayer, asking for the gods to solve a problem for us rarely, if ever, works in my own experience. I prefer to ask them for inspiration on how to get through this, or my spirit guides on where to go to next in order to resolve and issue. 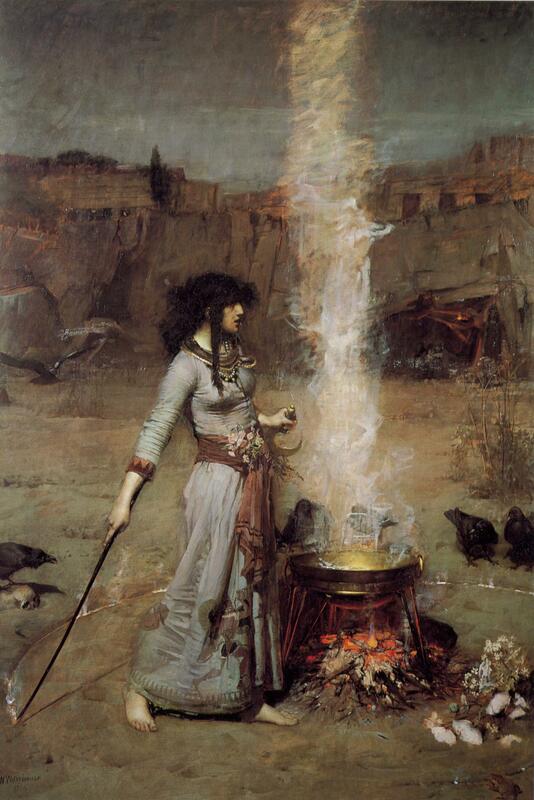 Casting a spell bypasses the question, in a way, and seeks to get an answer to a question not asked. Perhaps this is why I resort to magic so little, I always like to ask the input of others to seek out different perspectives on a situation. Again, this is only my own personal views, and others may have other ways of both prayer and spell-casting that are vastly different to my own. For me, as a Druid I am always questing the awen – for me, awen is the Grail. Inspiration, flowing spirit – it is such a beautiful word from the Welsh language that has so many different meanings. To me, awen is magic, though perhaps not in the spellcaster’s sense of the word. It is energy, it is flowing, it is the Tao and The Force of the Jedi Knight. It is something to be tapped into in order to gain a new perspective, to see the bigger picture, to obtain compassion. Awen is Buddhist enlightenment. It is the Christian “God is Love”. Instead of performing a magic spell, I might wander the heathland or forest, looking for inspiration around me. I might find a place to pray, using that inspiration to guide my prayers to better understanding of myself, the situation, the world. When all other recourses have failed, then I might try magic – the last recourse. I feel that magic is something special, something not to be abused or overused. We often hear the term “god-bothering” and magic may indeed be another form of “bothering” – whether it is the elements, the energy of nature, or something else entirely. I feel that Druids on the whole would turn to awen rather than magic, but perhaps with the blending of Druidry and other traditions this could indeed change, or maybe even change back to the way Druidry used to be – who knows? Perhaps my quest for awen is my magic. Magic includes transformation, and questing the awen will indeed change someone. None of the knights on the Grail quest were ever the same. None who seek enlightenment will ever be the same person they were before. We are constantly changing anyways, living a life of impermanence and fluidity, of change and flux. Perhaps just tapping into that idea is magic, is awen.